Inder Loves Folk Art: Neuron art. Don't ask me why I decided to embroider a brain cell in crewel wool, but I did. I'm trying to break out of the whole flowers and bunny rabbits mold and do something more interesting. Also, free form embroidering is really fun. I just doodled lightly on the fabric with a white colored pencil and then dove in with chain and feather stitch. I made this into a tote bag, lined with fabric from an old pillowcase (see, I guess I did use those vintage pillowcases). But I'm not that happy with the bag, because I didn't give it a square bottom, or interface it, so it looks distorted and schlumpy when you put stuff in it. Also, I totally look like a hippy when I'm wearing it (not the worst thing in the world, but I was aiming for more hipster-weird). I haven't decided whether I'm going to try to improve on that yet. The dogs know just where the center of my attention is at any given moment, and congregate there. 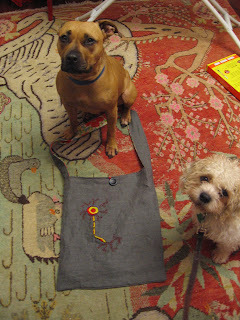 The only way I could get them to stop walking on the bag was to ask them to sit and pose for the photo. You can just see the pillowcase lining underneath Omie's belly. CUTE!!! Nice work! Ahhh ... I see what you mean about wanting to add some depth to the bag. That would totally help with the roll over. Otherwise, i think the world can always use more brain cells. This is Sonya from the ATA opening. That was a nice thought to embroider a brain cell on a bag. Novel concept must say and the name Neuron art suits so well. 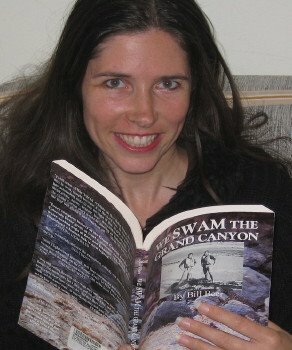 I have found this site on Folk Art, you might be interested. This is too fabulous! 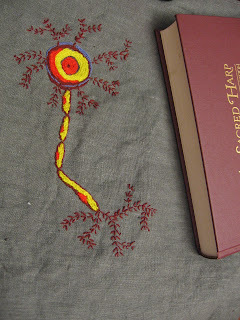 I wish more artists were doing great stuff like this -- maybe because I'd love to have a bag or jacket with an embroidered neuron. Too awesome!